In my parish, we have a stained glass window which shows St. Helena holding a cross. When I asked another parishioner "why?" she did not know. What is the reason? 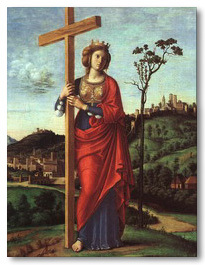 St. Helena is often depicted holding a cross because tradition maintains she found the true cross in Jerusalem. Before delving into this matter further, some background information is necessary. Because of Jewish insurrections, the Roman Emperor Hadrian (reign A.D. 117-38) abolished the name of Judea and renamed the area "Syria Palaestina." He also made Jerusalem a new capital, named "Aelia Capitolina," and forbade Jews from entering the immediate area. While Jerusalem remained mostly in ruins because of the revolt in A.D. 70 (when the Temple itself was razed), Hadrian demolished the rest. While regarding Judaism as insurrectionary, Hadrian regarded Christianity the same way. To eradicate the influence of Christianity, Hadrian leveled the top of Mount Calvary and erected a temple to the pagan goddess Venus. He also cut away and leveled the hillside where Jesus tomb stood and built a temple to the pagan god Jupiter Capitolinus. Ironically, this destruction actually preserved the sacred sites. The Emperor Constantine seized power in the year 312, and in the following year, legalized Christianity with the Edict of Milan. About this time, Constantine’s mother, St. Helena, converted to Christianity. (She died in the year 330 at about the age of 80.) According to the early great Church historian Eusebius, she was about 63 at the time of her conversion. With the authority of her son, St. Helena went to Palestine in search of the sacred sites about the year 324. In the following years, St. Helena would build churches marking the place of the Nativity in Bethlehem, and the site of the Ascension. True Christian zeal motivated St. Helena. Eusebius described her as follows: "Especially abundant were the gifts she bestowed on the naked and unprotected poor. To some she gave money, to others an ample supply of clothing; she liberated some from imprisonment, or from the bitter servitude of the mines; others she delivered from unjust oppression, and others again, she restored from exile. While, however, her character derived luster from such deeds ... , she was far from neglecting personal piety toward God. She might be seen continually frequenting His Church, while at the same time she adorned the houses of prayer with splendid offerings, not overlooking the churches of the smallest cities. In short, this admirable woman was to be seen, in simple and modest attire, mingling with the crowd of worshipers, and testifying her devotion to God by a uniform course of pious conduct" (The Life of Constantine, XLIV, XLV). About the year 326, the temple of Jupiter Capitolinus was demolished, and the workers began to excavate the area. They discovered the remains of the tomb that was reported to be that of our Lord Jesus. They built a new shrine over the tomb, which has been modified over the centuries, but today stands in the Church of the Holy Sepulcher in Jerusalem.
. . . the essence of the story follows: The three crosses and the titulus were removed from the cistern. A woman, dying from a terminal disease, was brought to the spot. She touched the crosses, one by one. After she touched the third cross, she was cured, thereby identifying the true cross. The temple of Venus was also demolished, thereby exposing the site where Christ was crucified. The Emperor Constantine himself wrote to St. Macarius, Bishop of Jerusalem, ordering him to make a search for the cross on Mount Calvary. A learned Jew named Judas seemed to have some knowledge of the whereabouts, and was pressed into service. Just east of the site, three crosses were found in a rock-cistern as well as the titulus (the wood plaque inscribed with Jesus Nazaranus Rex Iudaeorum). (With the Church of the Holy Sepulcher is the Chapel of the Finding of the True Cross, marking the cistern.) The question then arose, "Which was the cross of Christ?" While the details provided by St. John Chrysostom, St. Ambrose, Rufinus, and Socrates (not the philosopher) are lacking and sometimes contradictory, the essence of the story follows: The three crosses and the titulus were removed from the cistern. A woman, dying from a terminal disease, was brought to the spot. She touched the crosses, one by one. After she touched the third cross, she was cured, thereby identifying the true cross. Other sources also relate the later finding of other instruments of the Passion. Most importantly, St. Ambrose preached that when St. Helena found the true cross, "she worshiped not the wood, but the King, Him who hung on the wood. She burned with an earnest desire of touching the guarantee of immortality." St. Cyril of Jerusalem provides some corroboration. In his letter to the Emperor Constantius (Constantine’s son and successor), St. Cyril stated, "The saving wood of the cross was found at Jerusalem in the time of Constantine." In his fourth Catechetical Lecture, he wrote, "He was truly crucified for our sins. For if you would deny it, the place refutes you visibly, this blessed Golgotha, in which we are now assembled for the sake of Him who was here crucified; and the whole world has since been filled with pieces of the wood of the Cross." Another point: A reader in Canada asked, "Why is there a skull and two crossed bones placed at the foot of the cross in paintings of the crucifixion?" Many of the older depictions of the crucifixion do show a skull with two crossed bones at the foot of the cross. The tradition is that Adam was buried at Calvary. When our Lord died, His Precious Blood dripped down onto His skull. Again, in the Church of the Holy Sepulcher in Jerusalem, one finds the Chapel of Adam underneath the Chapel of Golgotha. The Feast of the Triumph of the Cross was Sept. 14. Let us remember the words of St. Francis of Assisi: "We adore Thee, O Christ, and we praise Thee, because by Thy Holy Cross Thou hast redeemed the world." Saunders, Rev. William. "St. Helena and the True Cross." Arlington Catholic Herald.